Happy New Year! Sweater weather has finally arrived and it’s back to work after a week and a half off. I’ll be honest, aside from dressing up for the holidays, I didn’t spend a lot of time planning outfits and my go to outfit of the week (which I didn’t photograph) was all J.Crew – Black Shrunken Wool Turtleneck, Black Chelsea Boots, Lookout high-rise jeans, Rib-Stitch Cotton Cardigan (old, similar here), and Excursion Vest. By this time of the season I’ve usually stocked up on new sweaters but with the milder weather, that hasn’t happened. 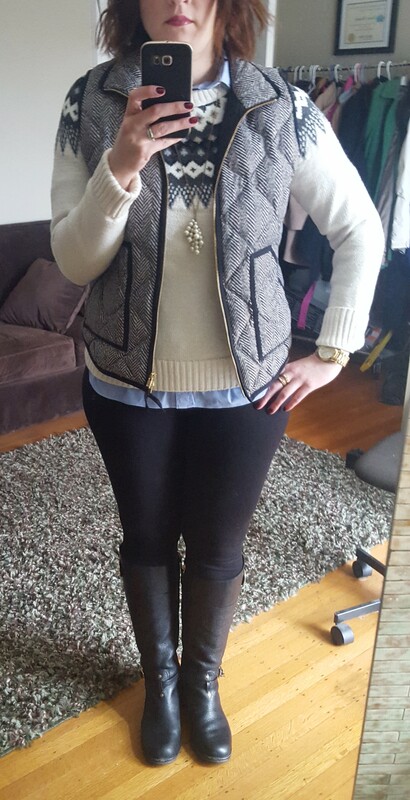 I did pick up the J.Crew Fair Isle Classic Turtleneck Sweater after the latest price cut. I went with the larger of my two sizes, since it did look like the sweater was on the shorter side, and that was the right call. The turtleneck itself is fitted and the body is looser. I did choose to wear a tank underneath. It wasn’t bad without one, but I did feel it was a little shorter in the back than I would have liked. The sweater is a wool, nylon, cashmere blend and the nylon definitely causes the material to be it not as soft as it could be. I’m not terribly sensitive when it comes to these things and I didn’t find it scratchy per se, but I could see how some people might find it uncomfortable or want to layer long sleeves underneath. The knit is nice and tight though so I didn’t have an issue wearing it with just a tank top. 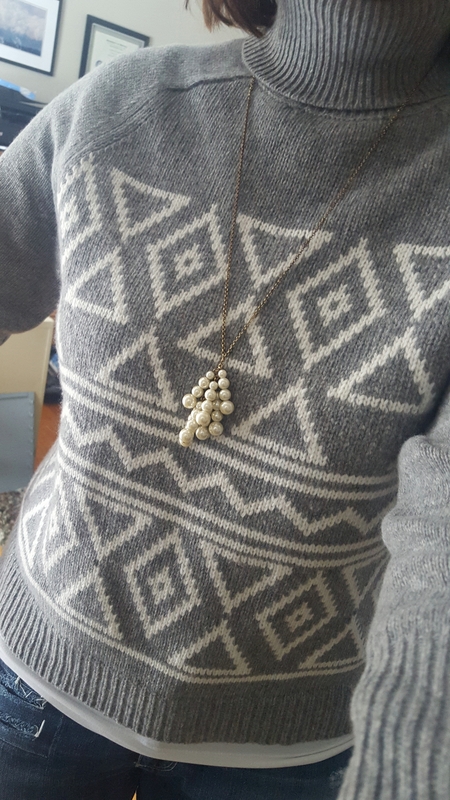 I would have liked it to be a smidge longer but overall, I like the different fair isle design and since I can’t seem to have enough grey sweaters, it’s a keeper for me. And of course, since it was snowy and blowy last weekend when I wore this outfit, the J.Crew Chateau Parka was the perfect top layer. 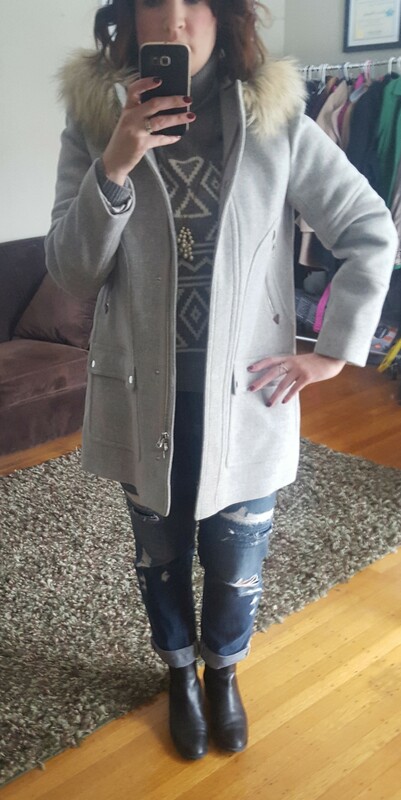 I bought this coat at the end of last season on sale and tucked it away – I’ve only worn it twice so far with this weather! I do have to say, I wish I had tried it on right away when I bought it because I did go with a 12 in this coat and with the swingy body in the coat, I may have been able to size down to a 10. But it is still a nice coat and kept me warm (even if I was an idiot and wore destructed jeans outside on a really cold day – holes in jeans, not so great in the bitter weather). I’ll admit, the jeans got swapped out later in the day when the sun went down and I had to run more errands after meeting up with some girlfriends for lunch. Lastly, another look from the week – nothing new, just some pieces that I am reaching for over and over again. I have rediscovered my love for my J.Crew Pixie Pants and seem to be reaching for them on the weekend more than jeans. Have you been buying less winter clothing with the lack of winter temperatures? Holding out for good sales? Would love to hear what you think and thanks for visiting. I’ll be back to posting about work clothes soon! I LOVE this sweater on you! I cannot wait to wear mine!